This is the basic kote do strike. 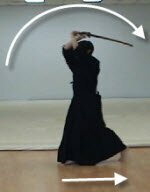 You will notice how hard do strike is when you put bogu (armour) on. And eventually you will learn faster version of kote and do strike. If you cannot do it slowly, you cannot do it fast. Trust me on this. As I explain in the basic kote men strike, I learned this as kote oyobi do. And again, you do not have to use OYOBI, if it is too hard to say. You can say "big kote and do strike" for the basic kote do strike. And you can say "small kote do" for small and fast kote do strike. Once you have learned kote oyobi men, this is easy. 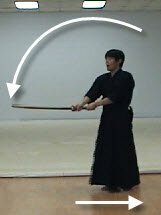 All you have to do is to change the second strike from kote to do. Again, we do not want to lift our sword as we do in men strike to strike kote. Do strike, however, should be a big strike. This is how the basic kote do strike, kote oyobi do uchi is done. 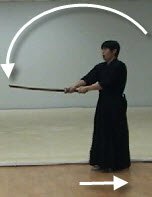 As you strike kote, snap up the left foot forwards. Make sure that the left foot does not pass the right foot or get too close to the right foot. Without going back to chudan (i.e. 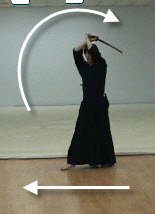 from the kote position), lift our sword up above our head and take a big step forwards onto the right foot. As you strike do, snap up the left foot forwards. Make sure that the left foot does not pass the right foot or get too close to the right foot. Now we are going backwards. While lifting our sword up as high as we can see the right kote of our opponent, take a step backwards onto the left foot. 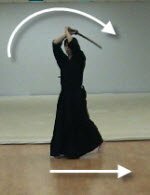 While striking kote, snap the right foot backward. 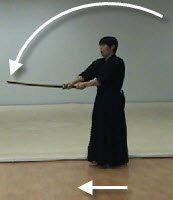 While striking do, snap the right foot backward. 1. Kote oyobi do. Hajime! 1. On each count, the practitioners strike kote and do. So they shout, "Kote, do! " 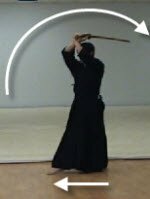 Make sure that you do not bring your hands above your head when you strike kote.That is not a big kote strike. Big kote strike is not as big as big men strike. Please refer to kote uchi for more information. The left foot stays behind the right foot. You can watch a brief video below. You can select "kote oyobi men" or "kote oyobi do" by clicking the links shown below the video. For kote strike, take a smaller step forward. Take a big step forward onto the right foot when striking do. When striking kote, make sure that you are striking your opponent kote. People tend to strike a higher place than the actual kote height. 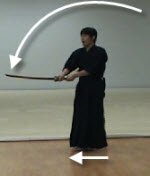 When striking do, make sure you turn your sword so you can use the blade to cut the do. Each strike must be done properly and completely.